Summary: A reminder for all of us. 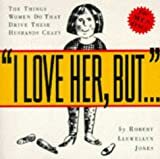 Review: I bought this book for my husband on a whim as a reminder that he is not alone and that it all depends on perspective. A definite book to keep reminding whomever you love that your little quirks aren't any different from anyone else's. And everyone has quirks! Summary: Even I thought this was funny--and I'm one of the "her's"! Review: My husband received this book as a gift a number of years ago. I read it before he did and thought it was great! I saw not only myself in this book but my husband as well. I highly recommend this book if you want a good laugh.